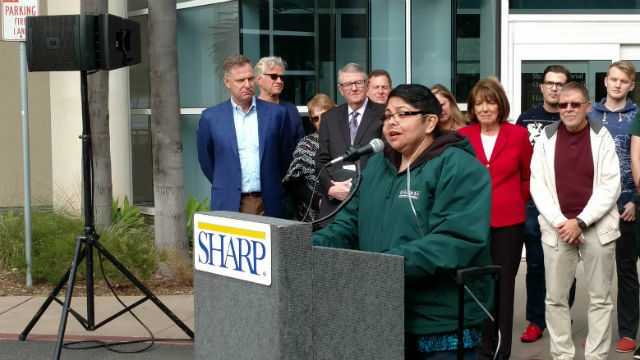 An executive with Sharp Healthcare joined Democratic Representatives Susan Davis and Scott Peters on Sunday to call on Congress to preserve key features of Obamacare. Dan Gross, executive vice president for hospital operations at Sharp, said his company stands to lose $300 million over a decade if the Affordable Care Act is repealed and key provisions are not replaced. Davis, Gross and Peters were joined by doctors and cancer patients at a press conference outside Sharp Memorial Hospital. Their remarks were in response to Congress taking the first step Friday toward repealing President Obama’s signature legislative accomplishment. The law requires all Americans to have insurance in order to increase the size of the medical insurance pool. That in turn helped insurance companies fund policies for people with pre-existing conditions and end caps on lifetime benefits. In addition, the federal government subsidized policies for people with the lowest incomes. Some 20 million Americans have become insured under the law. Republicans have talked about keeping the changes for pre-existing conditions and caps, but eliminating the requirement to have insurance, called the individual mandate. However, there is no agreement on how to replace the funding, and Peters warned of a potential “crater” in the federal budget. “You can’t expect the things we like about the Affordable Care Act without having everyone in the pool,” said Peters. He said if there is no requirement to have coverage and people can “call for health insurance on the way to the hospital” it will bankrupt the insurance system. Davis said the current law isn’t perfect, but 300,000 people in San Diego County are now insured for the first time because of it. “They are scared to death of losing their coverage,” she said. “Whose going to hold him at my funeral if they repeal the Afforable Care Act?” she asked.